Goldtouch's marketing slogan, "Productivity Through Prevention," is pretty close to home for me, capturing the dynamic I've been obliged to practice for the past decade or so battling fibromyalgia and polyneuritis, juggling the balance between productivity and disability - at least insofar as typing and mousing on computers are concerned. Keyboards especially are a problem for me. The few I can tolerate for more than a paragraph or two of typing are few and far between, including the Kensington SlimType, some of the Apple USB keyboards, a few ancient ADB 'boards like the Macally Wave, and the built-in keyboards of the G3 Series and G4 PowerBooks and pre-"chiclet" MacBook Pros. The jury is still out on the chiclet 'board in my Unibody MacBook, which I use most of the time with an external keyboard. 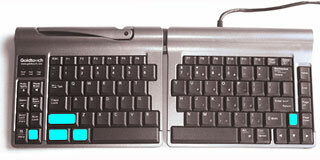 There are ergonomic keyboards on the market as well with a variety of approaches and innovations, such as the radical Kinesis Contour boards and the less-radical but still somewhat unorthodox Key Ovation Goldtouch keyboard, which claimed to be the first fully adjustable ergonomic keyboard for Macintosh users. I reviewed the standard Goldtouch Apple compatible keyboard some time ago, finding it solidly built piece of work. Goldtouch's signature approach is adjustable pronation, allowing you to configure its two split alphanumeric keypad sections both horizontally and vertically to suit your individual body requirements, thus easing stress on the carpal tunnel and nerves and tendons in the wrist. Placing your hands flat on the keys of a keyboard can require considerable muscular effort, which in turn can cause fatigue and discomfort. 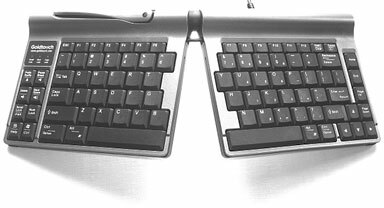 The Goldtouch keyboard's two keyboard segments can be raised at the center to more closely match the natural alignment of the forearm and wrist. Forcing your hands down to the keyboard is a hand movement known as pronation. This is the rotation of the right hand in a counterclockwise direction and clockwise for the left. The theory is that assuming a more natural posture with the wrists at a relaxed angle is conducive to relieving unnatural stress on muscles and tendons, thus improving comfort and productivity while using your computer. For example, if you orient the Goldtouch's keypads in an inverted-V "vertical tenting" configuration with the nearsides splayed, your hands and wrists can assume natural pronation body-English that does not stress joints and tendons, or the carpal tunnel. Adjustment within the 0° to 30° range in both planes is infinite, quick, and easy to change. 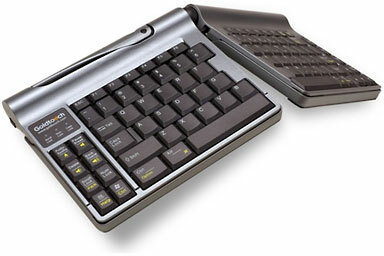 The major downside of the Goldtouch keyboard for road warriors is that it's pretty bulky (notwithstanding having no numeric keypad) and heavy for its size, presumably thanks to a rugged, durable construction, but not something you would want to pack along in your computer case or backpack. Goldtouch has now addressed that problem for road warriors with the new Goldtouch Go! 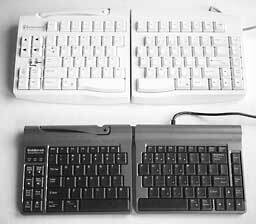 Travel Keyboard, which retains the standard Goldtouch keyboard's lockable center-articulation function, but incorporates it in a much more compact and lighter package - indeed one of the smaller and lighter freestanding keyboards of any sort that I've ever used writing just 1 lb. 1 oz., and measuring 13.25" x 6" x 1" at its thickest point. With full-sized keys approximately the size as those found on 14" notebooks, the Go! Travel Keyboard can accommodate large fingers but offers similar key feel and travel distance as found on standard Goldtouch 'boards. The compact Go! Travel Keyboard is well-suited to use in limited space environments and, with no numeric keypad, allows external mice to be placed closer to the main keyboard, reducing shoulder pain and increasing comfort. The first, somewhat disconcerting impression one has of the Goldtouch Go! Travel Keyboard upon opening the shipping box is that it appears to have no keys at all, because the keyboard halves are equipped with slide-off covers to protect keyswitches from dirt and impact damage when in transit in a backpack or computer bag. The covers can also be used to sit the keyboard on when in use - a neat touch I've never seen on any other laptop-oriented freestanding keyboard before, although the screen lid serves that function on the laptop itself. The covers slide off easily, once you figure out how they work, but it might be a good idea for Goldtouch to add some sort of indication of what to do - embossed arrows or silk-screened instructions on the top perhaps. It took me several minutes to figure it out. 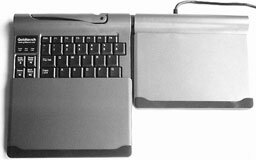 The covers slide onto the undersides of the keyboard halves for storage and also have a full-width rubber "foot" pad that, along with smaller pads at the back of the unit, supply traction so the 'board doesn't slide around on its support surface. These also allow you to use the Goldtouch Go! situated on top of the laptop's own built-in keyboard if desired without risk of scratching. Mac-to-PC is left Control/Option-left Control (green control key)-left Shift-Up Arrow (on the right side). One caveat is that Goldtouch recommends switching the keyboard from Mac to PC mode before unplugging it from a Mac, because if the keyboard is left in Mac mode and you want to use it with a PC, the computer may not recognize it immediately. The Goldtouch Go! Travel Keyboard requires Mac OS X 10.4 or higher. The convertibility feature could be especially slick for folks who run both the Mac OS and Windows in Boot Camp or Parallels on their 'Books. 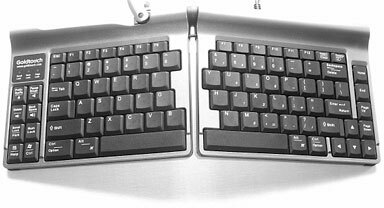 Not being a touch typist, I find the adjustment to nonstandard keyboard layouts a bit of a challenge, as my conditioned relationship with key location tends to be spatial/visual rather than by tactile feel. On this 'board I find it consistently and annoyingly easy to hit the Caps Lock key, which juts into the QWERTY area where one expects the "A" to be located, but I expect touch typists will have less difficulty. The keys themselves have a low-effort action, with medium 3.2 mm travel and a very light touch (39 g. to 42 g. resistance). Not quite as good for me as the trusty SlimType, but one of the better 'boards I've tried, with smooth key action that has no clicking shock or over-center sensation to it, although the landing is a bit harder and more abrupt than I prefer. If you like "clicky" keyboards, this one is not for you. There are no wrist rests, but the 'board is so slim that the support surface it's sitting on should suffice when you're using it in flat mode. The articulation feature works similarly to the way it does on the standard Goldtouch keyboard, with a large locking "over center" lever on the left keypad to release and clamp the ball joint connecting the two halves of the keyboard. It works easily and intuitively, and when in locked position the 'board feels quite secure and solid. You can adjust keyboard angle infinitely between flat and the limit of elevation, and likewise for lateral splay - 0° to 30° adjustment for ulnar deviation (wrist splay) in the horizontal plan, combined with 0° to 30° adjustment for wrist pronation (vertical tenting). You can of course also use the Goldtouch Go! 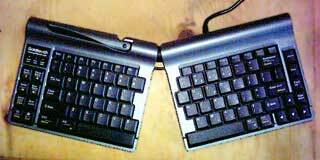 keyboard in conventional flat orientation. You would probably not want to pay the premium price for this sort of use exclusively, but it is very convenient if more than one person uses the computer and other users are not accustomed to and comfortable with typing on a split and angled orientation 'board. A particular point of appreciation I want to emphasize is that despite its compact size, the Goldtouch Go! Travel Keyboard has a USB repeater port - something seldom seen on laptop-oriented keyboards - or for that matter even on some larger sized ones these days (in fact, there were none on the full-sized Goldtouch Apple Compatible 'board I tested). If they can find room in a 'board this tiny for a USB port, no one has any excuse for not including one. The extra USB port looms especially large in importance with Apple's port-impoverished MacBook lines, most critically of all for the MacBook Air with its pathetic single USB port. I'm less enamored of the lack of a numeric keypad, although I appreciate the rationale in keeping the keyboard's footprint modest in a unit designed for mobile use. There is a keypad function embedded in the right-hand keypad and activated using the Num Lock key. 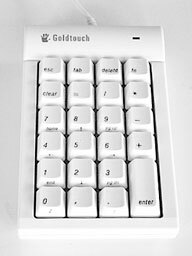 Goldtouch also offers an optional, freestanding numeric keypad module for $49.95. Bravo for including page navigation keys, although they have an unorthodox layout vertically on the right periphery of the keyboard, with the End key non-intuitively located just below the Home key instead of at the bottom, where you would expect to find it. There's also a Forward Delete key (hooray! ), and a standard inverted tee set of arrow keys, but I do miss having a dedicated Function key. The also ambidextrously labeled Apple Option and Command modifier keys are in their usual positions when in Mac mode, and they morph into Control and Alt respectively when in Windows mode on both sides of the twin spacebars. Above the left column keypad there are three indicator LEDs for Scroll Lock, Num Lock, and Caps Lock. Unlike the rich creamy shade of the standard Goldtouch Apple compatible keyboard I tested (black is also available), the mobile version is in a somber, dark shade of gray, which will be good for camouflaging dirt but makes the key caps a bit murky for those of us who depend partly on visual identification - a shortcoming shared with the black chiclet keyboards on Apple's current laptops. I prefer corded keyboards to wireless, and this one has a nice long cord. Like the full-sized Goldtouch, the Go! Travel 'board is on the pricey side - indeed the mobile 'board is $10 more expensive at $139 - but this is a highly engineered, quality constructed piece of equipment, and if it eases your typing pain, you'll probably deem it an investment in productivity through prevention and hence cheap at the price.